With the theme of ‘Mobilising Finance for Infrastructure: Innovation and Collaboration’, the Department of Economic Affairs, Union Ministry of Finance and the Asian Infrastructure Investment Bank (AIIB) announced to jointly host the third Annual Meeting of the Asian Infrastructure Investment Bank (AIIB) on June 25-26, 2018 in Mumbai, India. Industries Department of the Maharashtra Government is the nodal Department, while the Maharashtra Industrial Development Corporation (MIDC) is the nodal agency. The Confedartion of Indian Industry (CII) is the Professional Conference Organiser (PCO); Research and Information Systems for Developing Countries (RIS) is the knowledge partner for the third Annual Meeting of AIIB that will be inaugurated by the Prime Minister Narendra Modi. 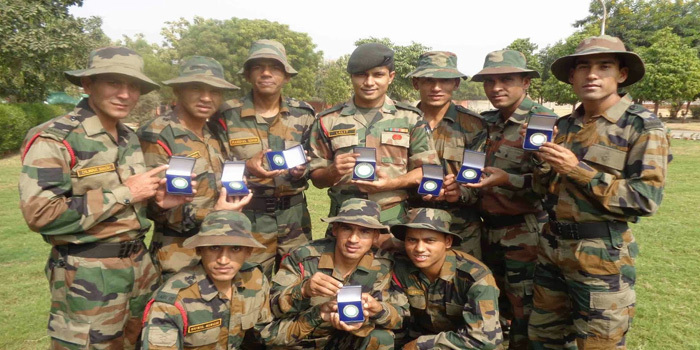 The 7 Garhwal Rifles Infantry Battalion Group that was awarded the United Nations Medal for “selfless service” in South Sudan. The Indian Army said that the 7 Garhwal Rifles Infantry Battalion Group, which is part of the UN peacekeeping force in South Sudan, was awarded the United Nations Medal for “selfless service”. The ceremony, held on June 22, was attended by a number of military and civil dignitaries, including Brig Gen Mohammed Al Masoom, Commander United Nations Mission in South Sudan (UNMISS), and a host of senior commanders of various nationalities. The parade was reviewed by UNMISS Deputy Force Commander, Maj General Bayarsaikhan Dashdondog. The Unique Identification Authority of India (UIDAI) has notified that use of Aadhaar biometric data for criminal investigation is not allowed under Aadhaar Act, 2016. This comes after National Crime Records Bureau (NCRB) Director Ish Kumar made strong pitch for police to be provided with limited access to Aadhaar data to aide them in catching first-time offenders and for identification of unidentified bodies. As per Section 29 of the Aadhaar Act, the biometrics data collected by UIDAI can be used only for purpose of generating Aadhaar and for authentication of identity of Aadhaar holders and cannot be used for any other purpose. Mongolia launched construction of its first oil refinery on 23 June, 2018 a long-awaited project that is funded by India and designed to end the country’s dependence on Russian fuel. The Minister of Home Affairs Rajnath Singh and the Mongolian Prime Minister Khurelsukh Ukhnaa attended the ceremony. The refinery, in southern Dornogovi province will be capable of processing 1.5 million tonnes of crude oil each year that is about 30,000 barrels per day (bpd). After six months campaign being launched to promote energy efficiency in the area of air-conditioning, the Union Ministry of Power is considering making 24 degrees Celsius as mandatory default setting and labelling of air conditioners within few months. The campaign was launched on voluntary basis to increase awareness and encourage consumers to adopt the guidelines. It will result in substantial energy savings and also reduce greenhouse gas emission. Every one degree increase in temperature of air-conditioner results in saving of 6% of electricity consumed. Frustrated with the alleged indifference of State officials, a Cabinet Minister in Uttar Pradesh took hold of a spade himself to repair a road in his native village in Varanasi. U.P. Backward Class Welfare Minister Om Prakash Rajbhar claimed that a 250-metre stretch of mud road near his house in Fatehpur Khonda village was not being repaired by officials despite several applications to the Public Works Department as well the District Magistrate. If a Cabinet Minister had to face such a situation, what would be the state of common citizens, he wondered. The government summoned the Deputy High Commissioner of Pakistan, Syed Haider Shah and lodged a strong protest after Indian High Commissioner to Pakistan, Ajay Bisaria was denied permission to visit the Gurdwara Panja Sahib near Islamabad despite having the necessary permission from Pakistan’s Ministry of Foreign Affairs, MEA. Gujarat Chief Minister Vijay Rupani launched a solar power scheme for farmers- Suryashakti Kisan Yojana (SKY) enabling them to generate electricity for their captive consumption as well as sell the surplus power to the grid and earn an extra buck. As per the scheme, farmers having existing electricity connection will be given solar panels as per their load requirements. The State and Central governments will give 60 per cent subsidy on the cost of project. The farmer is required to take 5 per cent cost, while 35 per cent will be provided to him as an affordable loan with interest rates of 4.5-6 per cent. The scheme duration is 25 years, which is split between 7-year period and 18-year period. Minister of Housing and Urban Affairs (Independent Charge) Hardeep Singh Puri on Thursday assured Animal Welfare Board of India (AWBI) to follow animal welfare norms for the development of metro and smart cities. SP Gupta, Chairman, AWBI handed over a memorandum to the minister in this regard to make provision for animals in the metros and the smart cities. The Board has taken decision to sensitise all the State governments and UTs for modernising and developing the cities keeping in view environment friendly approach in which special provision with respect to care and concern of the animals should be taken care of. Prime Minister Narendra Modi on 23 June, 2018 launched the Mohanpura Irrigation Project in Rajgarh district in Madhya Pradesh. The Rs 3,866-crore project includes a dam and a canal system that will benefit 727 villages in the state. It would irrigate 1.25 lakh hectares of land and provide drinking water to over 400 villages. The Maharashtra government’s state-wide ban on the use of plastic items, including carry-bags and thermocol, came into effect on 23 June, 2018. Chief Minister Devendra Fadnavis told that the plastic ban can succeed only if all the stake-holders support the move. “We want to promote responsible use of plastic. Therefore, we have banned the kind of plastic that cannot be collected, regulated and recycled,” he said. For the first time offenders, the fine will be Rs 5,000. For second time offenders, the fine will be Rs 10,000. Those who violate it for the third time will face a fine of Rs 25,000, along with imprisonment of three months. 1. Under which Act, Aadhaar biometric data for criminal investigation is not allowed? 2. What is the temperature to be set as default in air-conditioners according to Union Ministry of Power? 3. What was the aim of the scheme SKY launched by the Gujarat Government? 4. Which state banned use of plastic in June, 2018? 5. The Mohanpura Irrigation Project is launched in which of the following states?